Welcome to our... oh, never mind. HI-Washington DC, the new outpost of Hostelling International located downtown, has extended a warm welcome to, well, most cultures of the world. And we're sure their intentions were good -- but we're also pretty sure they weren't just trying to inform people of what language they may speak. 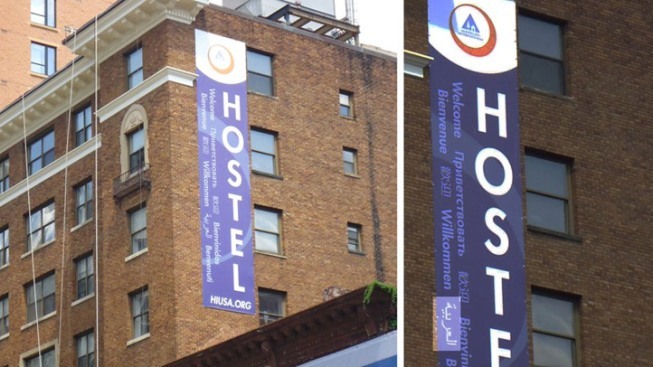 Peyton Sherwood (son of NBC4 reporter Tom Sherwood) sent us the following email: "Walking back from lunch today, I noticed the huge 25-foot new sign at the Washington D.C. Hostel which has 'Welcome' in English and several other languages... except in Arabic, which just says, 'Arabic'." Wait, maybe "Arabic" means "welcome" in the Arabic language. Ever think of that? No? The word "Arabic," which is on the sign, is written العربية according to Peyton Sherwood's friend Calvin Dark, who also snapped the photo above. A front-desk manager at the hostel said they hadn't had any complaints, but they now plan to take the sign down.